Verdaccio is a simple, zero-config-required local private npm registry. No need for an entire database just to get started! Verdaccio comes out of the box with its own tiny database, and the ability to proxy other registries (eg. npmjs.org), caching the downloaded modules along the way. For those looking to extend their storage capabilities, Verdaccio supports various community-made plugins to hook into services such as Amazon's s3, Google Cloud Storage or create your own plugin. What does Verdaccio do for me? If you want to use all benefits of npm package system in your company without sending all code to the public, and use your private packages just as easy as public ones. If you use multiples registries in your organization and need to fetch packages from multiple sources in one single project you might take advance of the uplinks feature with Verdaccio, chaining multiple registries and fetching from one single endpoint. 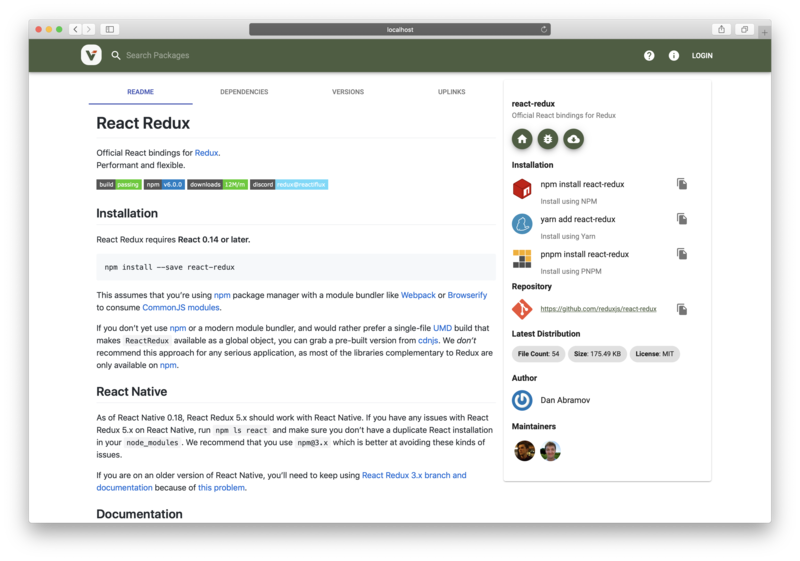 If you want to use a modified version of some 3rd-party package (for example, you found a bug, but maintainer didn't accept pull request yet), you can publish your version locally under the same name. See in detail each of these use cases. Verdaccio has proved to be a lightweight registry that can be booted in a couple of seconds, fast enough for any CI. Many open source projects use verdaccio for end to end testing, to mention some examples, create-react-app, mozilla neutrino, pnpm, storybook, alfresco or eclipse theia. You can read more in dedicated article to E2E in our blog. You would need set some npm configuration, this is optional. Now you can navigate to http://localhost:4873/ where your local packages will be listed and can be searched. Warning: Verdaccio does not currently support PM2's cluster mode, running it with cluster mode may cause unknown behavior. This will prompt you for user credentials which will be saved on the verdaccio server. Docker examples are available in this repository. Verdaccio aims to support all features of a standard npm client that make sense to support in private repository. Unfortunately, it isn't always possible. The core team is the responsable for drive this project, team is ordered by antiquity and areas of responsability. You can find and chat with then over Discord, click here or follow them at Twitter. Thanks to the following companies to help us to achieve our goals providing free open source licenses. If you have any issue you can try the following options, do no desist to ask or check our issues database, perhaps someone has asked already what you are looking for. The Verdaccio documentation and logos (excluding /thanks, e.g., .md, .png, .sketch) files within the /assets folder) is Creative Commons licensed.